Ready To Eat The Sky. Volume Four - The River City Poetry Series. Kevin Pilkington. River City Publishing. Montgomery, Alabama. 2004. 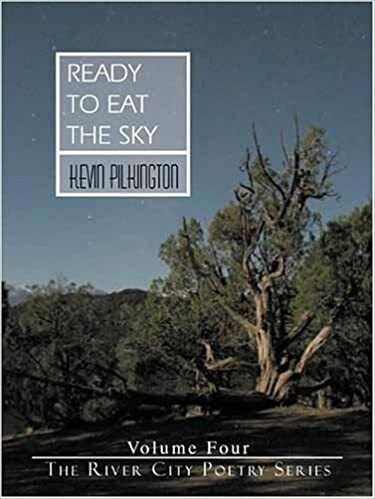 Ready To Eat The Sky by Kevin Pilkington was published in 2004 but it only arrived on our desks here at Today's book of poetry recently. I figure it was stuck in the mail somewhere between the continental divide and Swansea, Wales or Carmathenshire. Pilkington is a Dylan Thomas fan and devotee. If that's where you're going to set the bar you are dancing in pretty high cotton, you are going to have to be ready to burn. Kevin Pilkington is up to the task and does some pretty sweet cooking in Ready To Eat The Sky. Now I know Pilkington loves Thomas because I read it somewhere, you'd never see it in the poems, although it is certainly there. Pilkington loves language like birds love sky. These poems sound and feel like anecdotal narrative poems but that's a trick. What they really are is emotional Venus-fly-traps. Pilkington gets right into your bloodstream. good novel I dove into. leaning on two metal canes. the way I did a while back. Pilkington's golden tongue skirts the sweet edge of revealing too much, he's almost always on the verge of giving it all away. He's a tease. Once he gets you hooked he just starts reeling you in as easily as the big Hem on a Cuban fishing boat. The sweetness doesn't hurt a bit and there is always just a pinch of tart when you need it. When I did the office poll the vote was 9 to 1 for going with Pilkington today. Our typesetter, Milo, doesn't like a damned thing, he tells us daily, yells at us in fact, "that there hasn't been a poet worth his/her salt (he puts in that slash with a wild gesticulation of his little spindly spiny spider white arms) since Ezra lost his gamble!" We tolerate Milo because he can bake. It's white with black patches. dreams of rabbits or grouse. is what makes him bark. his a stick into tall grass. had as kids following him. Come on!! A poem about puppies. Give us a freaking break!! But, but, but, I love this poem, and almost every other single poem in this great collection. Pilkington could probably amuse me with a poem about the phonebook. Probably get a tear in my eye as well. Today's book of poetry was charmed, charmed, charmed by the elastic wit Pilkington uses as an emotional tightrope. These poems are constructed like the pyramids. One solid block on another. And so on. I read these poems like eating dessert, they were such a pleasure to devour. you bring into the country. you said the last ten years. a way out of your throat. never to speak it again. to squeeze her into Rome. line to, you laugh even louder. who doesn't have a prayer. Kevin Pilkington has made my day. Ready To Eat The Sky is a simply delicious book. Find it. Kevin Pilkington ​​​​​​​​​​is a member of the writing faculty at Sarah Lawrence College. He is the author of six collections: his collection Spare Change was the La Jolla Poets Press National Book Award winner and his chapbook won the Ledge Poetry Prize. His collection entitled Ready to Eat the Sky was a finalist for an Independent Publishers Books Award. A collection entitled In the Eyes of a Dog was published in September 2009 and won the 2011 New York Book Festival Award. Another collection entitled The Unemployed Man Who Became a Tree was recently published. His poetry has appeared in many anthologies including Birthday Poems: A Celebration, Western Wind, and Contemporary Poetry of New England. Over the years, he has been nominated for four Pushcarts and has appeared in Verse Daily. His poems and reviews have appeared in numerous magazines including: The Harvard Review, Poetry, Ploughshares, Iowa Review, Boston Review, Yankee, Hayden’s Ferry, Columbia, North American Review, etc. His debut novel entitled Summer Shares was published in June 2012. "In Ready to Eat the Sky the reader encounters a poet of extraordinary fineness of vision, one whose language adheres to the surface of realities with an elegance and simplicity rare in today's poetry. There is humility and grace of being in these poems, which stand before the world openmouthed, hat in hand, heart on sleeve. 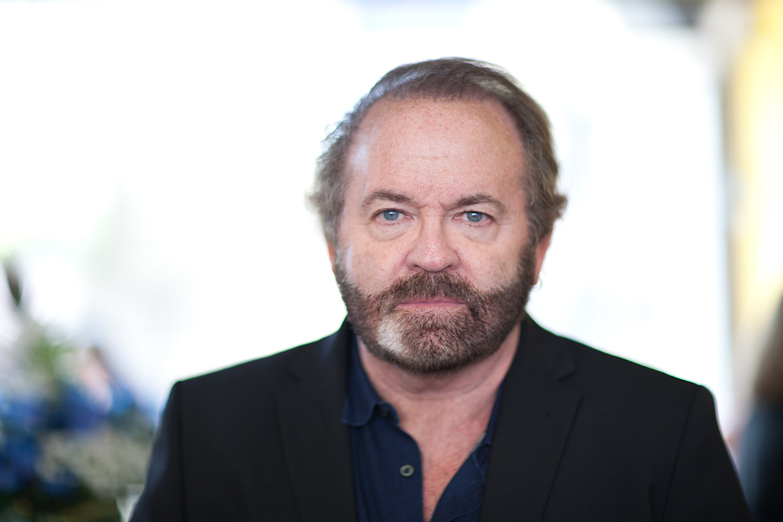 I take guilty pleasure in the poems of Kevin Pilkington, and consider him an essential voice in contemporary poetry." We here at TBOP are technically deficient and rely on our bashful Milo to fix everything. We received notice from Google that we were using "cookies" and that for our readers in Europe there had to be notification of the use of those "cookies. Please be aware that TBOP may employ the use of some "cookies" (whatever they are) and you should take that into consideration.